Ha! Ha! hah! 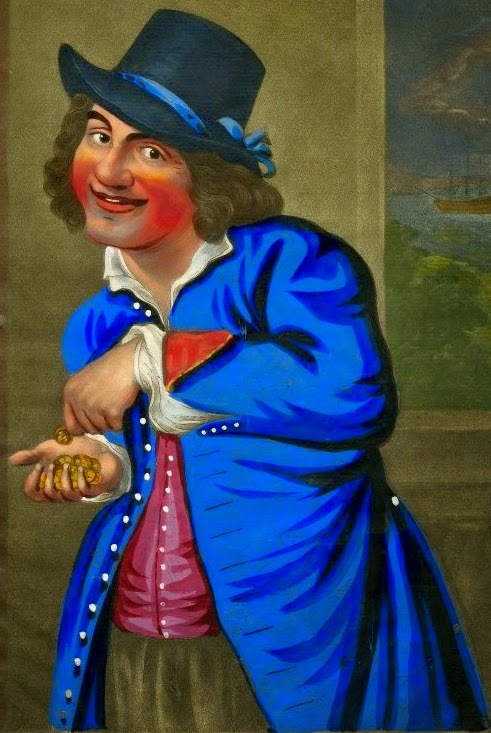 - I've got the Chink, Carington Bowles, 1770's, British Museum. 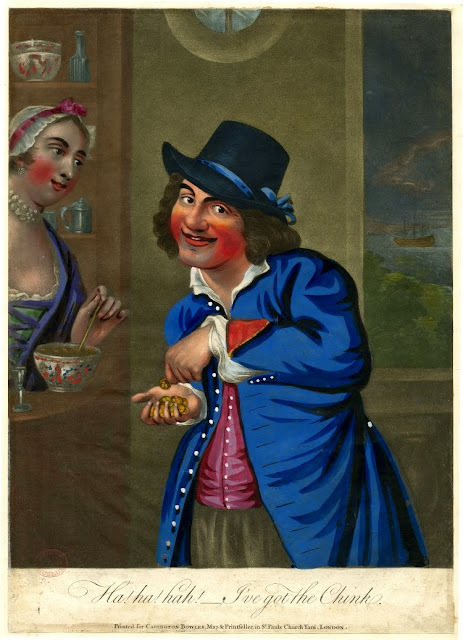 A rosy cheeked tar counts his coins under the watchful gaze of a tavern woman. She stirs the small bowl of punch that is certainly intended for this sailor. His long single breasted jacket is blue with slashed mariner's cuffs and no collar. Interestingly, it appears to be lined in red and bordered in yellow or gold. It may be that whatever brought him his fortune gave him enough for a finer jacket as well as that bowl of punch he so happily purchases. A round hat with an unusually tall and conical crown is fitted with a blue ribbon tied into a bow. He wears a red or raspberry single breasted waistcoat and what may either be interpreted as slops or a pair of trousers. EDIT: Follower Ike has shed a new light on this puzzling print. The sailor's tall hat and folded back cuffs lined in red are very odd for a seaman of this period, and were not drawn from common tars of the day. Instead, the figure comes from a seventeenth century print entitled "The Five Senses (personified by peasants): Hearing." You can see the original in the collection of the British Museum. Brilliant find! That does quite explain the oddities of this piece! I'll make an edit to it as soon as I can.